The Water Gipsies was my mum’s favourite film, or was it the musical – it was possibly both. Based on a 1930 novel by A. P. Herbert it was turned into a film in 1932 and a stage musical in 1955. I have vague memories of seeing the film repeated on the BBC in the 1950s – brightly lit and over-exposed in summery monochrome, it bore little resemblance to real life on the English waterways. I was also very familiar with the musical soundtrack as this was one of the LPs that my parents bought when my sister was given her first record player. Other dubious parental acquisitions included Oklahoma!, South Pacific and Noel Coward at Las Vegas – no wonder the Christmas that With the Beatles arrived was like emerging from a long dark tunnel into the light. In case she slips and takes a bath. Subterranean Homesick Blues it is not. In the late sixties, desperate to escape a dictatorial regime at home, I toyed with the idea of living on a narrowboat near Ye Olde No. 3 at Dunham Massey. Lacking the finance and any awareness of the practicalities it was an odd pipe dream which came back to me as we moored for water at the same location last week. In practice it was 1976 before I ventured onto the waterways, the same summer and the same canal as Timothy West and Prunella Scales started their life long watery journey. In a similar fashion I have been wedded to the cut ever since, so much so that I have a mental map of the English waterways which is at least as good as my grasp of the English motorway system – oddly, I can’t seem to overlay one on top of the other despite their regular proximity. We have spent the last ten days hibernating aboard a narrowboat. There is much to be said for confining your life to the 59 x 7 foot space available on Oakmere which, in reality, is about half that length, once you take away the fore and aft decks and the engine room. Some might consider this an overly active hibernation but locked in tight of an evening with the wind and rain lashing outside and the stove at full blast, we felt like Badger and Mole in The Wild Wood. It is also an occasion to bury heads in books and ignore the outside world. like dwarfs rushing through thickets. The problem is that this sad life intrudes regardless; we were stunned to hear of the sudden death of our good friend Norman Harris. A distinguished sportswriter, he had a 20-year career with The Sunday Times in London and also wrote for The Observer and The Times. I came to know him in his latter years through Allendale Golf Club where he was variously, Chairman, Secretary, Captain and finally, the longstanding Seniors Captain. He would be the first to admit that his golfing achievements were limited but he thoroughly enjoyed the game, loved the course at Allendale and, remarkably, sank two holes-in-one within the space of a few weeks. Search for ‘Norman’ on this blog and some of our joint activities will show up. I was delighted to be associated with his last four publications, producing the website for Scottie, and the book covers for his memoir Beyond Cook’s Gardens and the sports books What are You Doing Out Here and At Last He Comes. 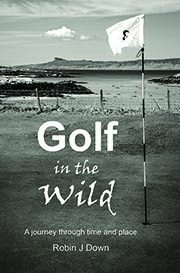 Inspired by this association I would also enter the literary fray, an endeavour which he enthusiastically and practically supported – I am proud that the words of “Norman Harris, The Times” grace the inside cover of Golf in the Wild. Deeply entrenched with this love of words he had a keen eye for the striking image and the two came together in his passion for film – he was, for many years, an active member of the Allendale Film Club. His departure is deeply saddening but the timing of his exit had an almost sportsman-like perfection. By chance he was visiting Barnes in London, the place where he lived for much of his professional career. He had just met a long-time friend and fellow sportswriter for lunch and then gone for a swim. A cinema outing to see The Lady in the Van was followed by a first-time visit to a Persian restaurant, all in the company of his great friend JMP (Beyond Cook’s Gardens is dedicated to this good lady). As last days go, there is much to envy. For many years, phone calls from Norman on a variety of topics had become a regular part of life’s routine, as had cinema and restaurant outings. He was booked in at our home for Christmas and we were looking forward to his annual quiz. The festive period will not be the same without him, nor life in general. Rest in peace Sir Norman, you will be missed. (There are a number of full obituaries available online including this enlightening version at stuff.co.nz. You can also listen to him talking on Radio New Zealand National).